Set a realistic schedule, it’s up to you! Keeping control of your schedule may be impossible on some days but shouldn’t be impossible most days. If it is, you might want to consider adjusting a few things and prioritizing others. For example, if you know that traffic is bad between 8-10 AM don’t schedule a meeting or appointment on the other side of town or miles away where you are certain to get stuck which is going to make you stressed which will start your day on the wrong foot. You could also consider using technology if you don’t necessarily have to be at the meeting in person. Could you use Skype instead? We use Skype to talk to our family a lot and it feels like we have a really good visit. We’ve also placed the laptop on the dining table while we are eating so that we can “have dinner” together! 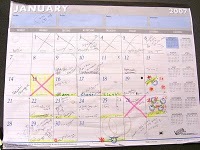 Have someone else think your schedule through with you to make sure if it makes sense. A few months ago I was in a tizzy because I needed to go to Costco and the highway is always crowded with traffic, etc. but my son, Peyton, suggested that instead of going to Costco on our way to his LAX clinic that I just drop him off and go while he’s there, Duh! I was so wrapped up in my head that I hadn’t considered that super easy option. Well done Peyton! I know that you can’t always cater your schedule to your needs but if you try to make it easier on yourself you will reap the benefits of a more relaxed day which this day and age is priceless! How do you schedule your day? Is it at your convenience or someone else’s? In reading through other Organizers Blogs I saw a short blurb on something that made total sense to me and I thought it would be something easy that I could share with my clients and friends. The statement we’ve seen before: “Take Only Pictures. 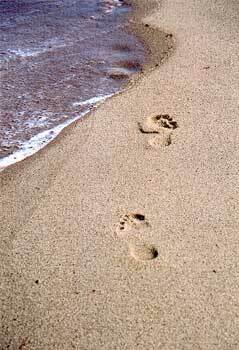 Leave Only Footprints” but in this case I want you to think about it more for your home than our National Parks. It’s the most basic and simple idea of keeping yourself organized: if you get it out, put it away… it honestly comes down to being just that simple. You can have the most organized, color coded, contained home but it you aren’t putting things away, chances are no one else in your house is either. It starts with the Matriarch and goes from there, sorry Ladies, we set the tone of the household be it good, bad or ugly. I have been tempted to just throw my jeans on the floor of my closet when I’m trying to get dressed in the morning and I’m running late but taking that extra 1.5 seconds (and that’s really all it takes) to hang the jeans back up allows me the peace of mind to know that the next time I open my closet I don’t have to go backwards in order to go forwards. I won’t have to clean up my mess from this morning in order to get ready for bed when I’m tired, likely cranky and just want to be done with my day. It’s the same with making the bed and leaving dishes in the sink, who wants to come back home to that? I’m reminded of the Nike slogan, “Just do it” and if you follow it, you can begin to stop that vicious cycle of always, always feel like you are catching up instead of really keeping yourself on top of things. So, start thinking about it – “Leave only Footprints” not piles of clothes, dishes air drying instead of taking a few minutes to wipe them down and put them away after you’ve done the dinner dishes. Just take that little step further and put the toolbox back in the garage vs. just putting it by the back door. Try it today and at the end of the day, see how it worked and how you feel, you’d be amazed at how little time it takes to stay on top of things. Holler back at me and let me know how you are doing, I’d love to hear from you! I didn’t jump on the bandwagon of ditching my CD/DVD cases right away but when I did, I was so happy! 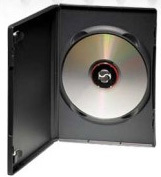 CD/DVD cases take up SO much room and can actually take over a large amount of space in your family/TV room. I went to Staple’s and purchased a really simple CD case such as this one and began pulling the DVD’s that we wanted to keep out of their cases and moved them into the new “book”. At first as a family we debated putting them in alphabetical order but that became nightmareish from the start so we simply put them in there randomly. We kept our Holiday videos in the back and some of the “sports” movies back there too. It’s not exactly stayed that way but the Holiday ones are back there and not mixed in with the others and that works out pretty well for us. Now, you might think that ditching the DVD cases is irresponsible. It is, unless your recycle them properly. In our town we recently switched to “single stream” recycling which is awesome because it takes a much wider variety of household items than they used too but if your town doesn’t participate in a liberal recycling program than you can login to Earth911 and find out how to recycle near you or maybe even ship your empty DVD/CD cases to a place that will recycle them for you. Either way, it feels really good to make all that space in your house and another bonus is that you’ve got them all in one place. We travel by car at least once a year for a pretty good distance and putting the DVD case in the truck and hitting the road is a great feeling for my kids as they don’t have to decide what movies to bring, they can bring them all! Are your CD/DVD’s taking over your family room?! I made the above statement into a Tip of the Day on our organizing website but I thought it warranted expanding upon with a blog post. Is there a class that you wanted to take? What about starting your own business or possibly standup comedy? No matter what your dream is, be it large or small, there has got to be something you can do today that will start paving the path towards your overall goal. As you go about your day today think about what your dreams are and how you might be able to do just a little something today that honors your dream. For me, it might be looking for some darling file folders to add to our office candy line, yum! You could get a book from the library or do some research online, or just start a file folder to collect articles as you come across them. Don’t forget about YOU. We need to remember to put our oxygen masks on first sometimes so consider this to be your reminder. 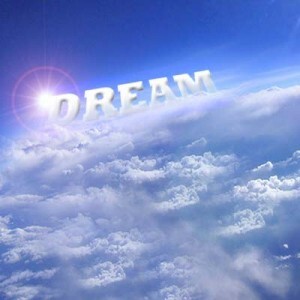 What is a dream that you have that you haven’t shared with anyone else?